Difficulty Somewhat complex to grasp, moderate to implement. This is fine, and you deliver it to production, and everyone is happy. But in the next iteration, a new requirement comes in that users want to be able to use a rocker switch or a push-button switch. And just as you’re getting ready to implement that, you’re also told that you need to implement a rotary switch (like a door deadbolt, you turn this to two different positions). Well, that’s fine, because you have just the trick up your sleeve in a polymorphic language: the interface! Now you’re all set. Not only does your overhead lamp operate with several different kinds of switches, but you’re following the Open/Closed Principle. Marketing can come in and demand a toggle switch, a fancy touchpad, or even a contraption that you smack with a hammer, and you handle it by writing and unit-testing a new class. Everything looks good. Alright, that code is going to work, but you’re a little leery of the fact that, after renaming IOverheadLamp to ISwitchableAppliance, the new classes you created were simply a result of copying and pasting the lamp classes and changing “lamp” to “computer.” You should be leery. That’s a design/code smell (duplication–don’t repeat yourself!) But whatever–you’re behind schedule and people are giving you a hard time. You can refactor it later. Now the next iteration starts, and marketing is wildly pleased with your computer/light switch. They want to be able to control any sort of appliance that you can imagine–the aforementioned space heaters, ceiling fans, refrigerators, plug-in light sabers, whatever. Oh, and by the way, computers don’t necessarily turn on when you flip the switch for the outlet that they’re plugged into, so can you have the computer not turn on when you turn the switch on, but turn off when you turn the switch off? Oh, and remember that hammer-operated switch? They want that too. Well, you’re hosed. You realize that you’re going to have to copy and paste your three (four, with the hammer thing) classes dozens or hundreds of times, and you’re going to have to change the behavior of some of them. All of the computer ones, for instance, don’t automatically turn on when you activate the switch. But clients of your code don’t know that, so they’re now going to have to try to cast the ISwitchableAppliance to one of the classes ending in Computer to account for its special behavior. This just got ugly, and fast. The first diagram is what we were doing. Conceptually, every appliance consists not only of the appliance itself, but also of the switch that turns it on or off (or does something to it, more generally). In the second diagram, we’ve separated those concerns, realizing that the appliance itself and the switching mechanism are two separate entities capable of varying independently. In looking at this version of it, we see some new concepts introduced: abstraction and implementor. I’ll explain the theory behind this in the next section, but suffice it to say for now that our abstraction is the switch and our implementor is the appliance. As the diagram depicts, our clients are going to deal with the abstraction, and they’re going to do so by handing it a reference to the implementor that they want. More concretely, our clients are going to instantiate some switch and tell it what device they want it to control. Notice that because our implementation up until this point has been pretty simple, the interfaces look almost identical (minus the HasPower, TogglePower() in IAppliance, which we’ve added with our new requirement in mind). Both the appliance and the switch have the concept of on and off, more or less. This similarity was what allowed us, up until now, to operate under the (faulty) assumption that these two concepts could easily be combined. But we ran into difficulty when we saw that the abstraction and the implementation needed to vary separately (more on this later). Where we got into trouble was with the concept of toggle power and distinguishing between having power and being on. That makes sense for an appliance (is it turned off or unplugged?) but not for a switch, which only knows that it has two positions and that it’s in one of them. So, with the introduction of this new requirement, we can no longer operate under even the pretense that mashing these two concepts together is a reasonable thing to do. The key thing to notice here is that ISwitch has a reference to an IAppliance. This means that clients instantiating a switch can hand it an appliance on which to operate. But we’ll look at client code later. Here, notice the distinction in the behavior of TogglePower(). For lamps, supplying or removing power supplies and removes power but also turns the lamp on and off, respectively. For computers, removing power turns the computer off, but supplying power does not turn it on. (Some other client of the API will have to do that manually, ala real life.) Now that we’ve decoupled the actual implementation of the concept of appliances being on and off from the abstraction of initiating that implementation, our appliances can change how they behave when power is supplied or removed. We could introduce a new appliance, “BatteryPoweredAlarmClock,” that didn’t turn off when power was cut (or, more accurately, kicked off some long running timer that would turn it off at some point later). Notice that the individual implementors still retain their own unique properties. Rocker still has up or not up, and Rotary still has its position. But the things that all share are implementations of the OperateSwitch() method, the IsOn property (it might be more accurate to rename this “IsInOnPosition” to avoid confusion with the appliance On/Off state, but I already typed up the code examples), and the IAppliance property. In addition, all of them operate on the appliance’s TogglePower() method. This last distinction is important. Switches, in concept, can only supply power to an appliance or take it away–they don’t actually switch it on and off. It is up to the appliance to determine how it behaves when power is supplied or removed. As this implementation is continued, it is important to remember this distinction. I could have omitted ToggleOn() from the appliances’ interface if this code were in a vacuum because the switch has no use for it. However, assuming that we’re modeling something a little broader (like, say, my home automation pet project), we clearly want people in houses to be able to turn on their computers and televisions. The switch is unlikely to be the only consumer of IAppliance. Here’s an example application, cutting out any considerations like factory classes or methods. We have some method that takes a switch as input and returns a computer in the state the method put it in. Conceptually, this is pretty simple–we’ve done all the hard work. You just take your switch, set it to operate some appliance, and then operate away. To answer that first question, I’ll say, “yes.” Defining an interface says, “Any implementors of this interface will define a method that takes these parameters and returns this type of value, and the details are up to the implementor to sort out. The client doesn’t care how–just get it done.” So, in a manner of speaking, the method signature is the abstraction and the implementation is, well, the implementation. The problem is that this is a code abstraction rather than a modeled abstraction. That is, a method signature is a contract between one developer and another and not between two different objects. A switch isn’t an interface to a device in C#–it’s an interface to a device in the real world. A switch has its own properties, operations, and state that needs to be modeled. It can’t be reduced in code to a method signature. So what are we getting at when we say that we want to decouple an abstraction from an implementation? Generally speaking, we’re saying that we want to decouple a thing of some sort from operation performed on that thing. In our example, the thing is an appliance, and the operations performed on it are supplying or removing power. The switch (abstraction) is a separate object with its own properties that needs to be modeled. And what’s more, we can have different kinds of switches, so long as all of the switches perform the needed operation on appliance. The decoupling allows us to have different subjects and for different objects to behave differently during the course of the verb operation. So if I use the Bridge pattern to model “Person eats Fruit,” it isn’t hard to specify that some fruits leave a pit or a core and some don’t following the eat operation. It isn’t hard to have some people get indigestion as a result of eating fruit. And neither one of those new requirements merits a change to the other one. Fruit doesn’t change if it gives people indigestion, and a person isn’t changed when a piece of fruit they eat has a pit. The Bridge pattern has as many uses as you can conceive of “A verb B” pairs that might have some variance in the A and B, so I’ll list a handful that lend themselves well to the pattern. The Bridge Pattern makes sense to use when you have two objects participating in an action and the mechanics of that action will have different ramifications for different types of the participating objects. But, beyond that simple distinction, it makes sense when you are likely to need to add participants. In our example, different appliances behaved differently when power was supplied or removed, and different switches had different behaviors and properties surrounding their operation. Additionally, it seemed pretty likely after the first round or two of marketing requests that we’d probably be adding more “subjects” and “objects” in perpetuity. This is where the Bridge pattern really shines. It creates a situation where those types of requirements changes mean adding a class, rather than changing existing ones. And, it obviates duplicating code with copy and paste. I’d summarize here by saying that the Bridge pattern is a good fit when you are modeling “A action B,” when A and B vary in how the action affects each one, and when you find that coupling A and B together will result in duplication. Conversely, it might be a good pattern to look at when you’re faced with the prospect of a combinatorial explosion of implementations as requirements change. That is, you can tell that A and B should be decoupled if you find yourself with classes like A1B1, A1B2, A2B1, A2B2. Don’t use this pattern if A and B are really appropriately coupled. If, in your object model, switches were actually wired to appliances, our effort would be unnecessary. Conceptually, it wouldn’t be possible to use one appliance’s switch on another–each appliance would come with one. 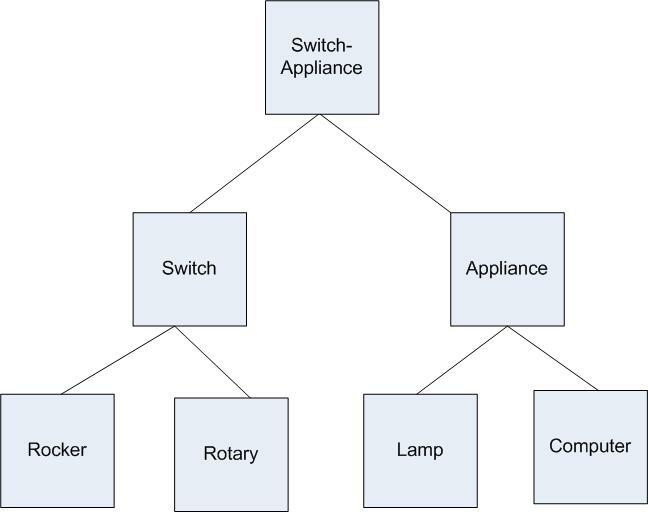 So you define the different types of switches, give each appliance a concrete switch, and define “TurnOn” and “TurnOff” as methods on the appliance. The Bridge pattern is meant to be used when real variance occurs between the actors involved, not to be used any time one thing performs an operation on another. There’s always YAGNI to consider as well. If the requirements had stayed as they were early in our example–we were only interested in lights–the pattern would be overkill. If you’re writing a utility specifically to model the overhead lights in a house, why define IAppliance and other appliances only to let them languish as dead code? Apply the bridge when you start getting actual variance in both objects, not when you just think it might happen at some point. In the simplest application, having to supply Switch with your only appliance, “OverheadLamp,” is wasteful and confusing. Finally, Bridge has a curious relationship with Adapater, which I covered earlier. Adapater and Bridge have conceptual similarities in that they both link two objects and allow them to vary independently. However, Adapter is a retrofit hack used when your hands are tied, and Bridge is something that you plan when you control everything. So, don’t use (or try to use) Bridge when you don’t control one of the participant hierarchies. If, say, “RockerSwitch” et. al. were in some library that you didn’t control, there’s no point bothering to try a bridge. You’d need to adapt, rather than bridge, the switches to work in your implementation. So, why do all this? We’ve satisfied the requirement about computers behaving differently when the switch is flipped, but was it worth it? It sure was. Consider how the new requirements will now be implemented. Marketing wants 100 new appliances and a new switch. Sure, it’s a lot of work–we have to code up 101 new classes (100 for the appliances and 1 for the switch). But in the old, mash-up way, we’d have to code up those 100 new appliance classes, copy and paste them 3 times each, code up a new switch class, and copy and paste it 102 times, for a total of 403 new classes. And what if we made a mistake in a few of the appliance classes? Well, we’d have to correct each one 4 times because of all the copy/pasted code. So, even if the idea that not duplicating your work doesn’t sell you, the additional development and maintenance should.